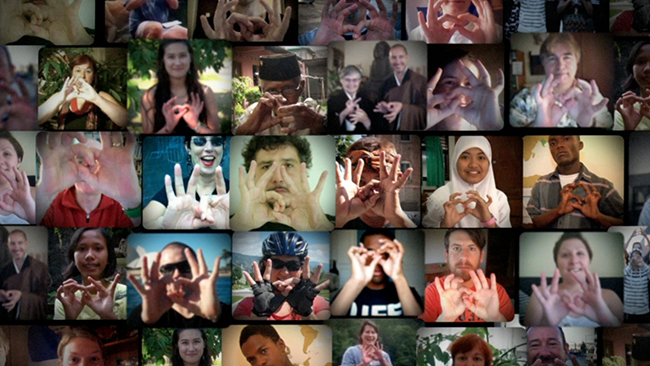 A Declaration of Interdependence was our first experiment in global collaborative filmmaking. The outcome blew us away, helped us pioneer “Cloud Filmmaking,” and, three years later, evolved into an annual day and global initiative called Character Day. First we rewrote the U.S. Declaration of Independence to be A Declaration of Interdependence, and posted the script online. Then we asked people all over the world to film themselves reading the script in their native language, and to send us the videos. We also asked artists to interpret the words and ideas, and send in artwork. This is the film that unfolded. With music by Moby, animations by Stefan Nadelman, directed by Tiffany Shlain, and user-generated videos and graphics from all over the globe, A Declaration of Interdependence demonstrates the vast potential of collaboration in the 21st century. See complete list of credits and participants from all over the world. A Declaration of Interdependence premiered on Interdependence Day September 12, 2011, simultaneously live at Interdependence Day in New York City near Ground Zero, and online as Youtube’s featured homepage video. Interdependence Day is held every year on September 12th, the day after 9/11, to celebrate our interdependence. It has taken place in places such as Paris, Casablanca, Mexico City, Brussels, Istanbul, and Berlin. A Declaration of Interdependence has been volunteer translated into nearly 70 languages. (On the bottom right-hand corner of the video above, click the CC icon and scroll down to see the languages).